13. oktober slipper far-og-datter duoen Bob og Una Walkenhorst sin debutplate For Tomorrow. I dag har vi den store glede og ære av å få presentere første låt fra platen – og byr også på et lite intervju med Bob og Una. Musikkvideoen til tittelsporet «For Tomorrow» har blitt en sterk og tankevekkende affære, der ung energi og ønske om å endre samfunnet til det bedre møter klok og erfaren livserfaring gjennom ord og musikk. Dette preger også hele platen For Tomorrow, der en Bob Walkenhorst som har levd, reist og sett – på mange måter observerer, oppmuntrer og kommenterer datteren Unas energi, stå-på vilje og ønske om å utgjøre en forskjell. Det er ingen hemmelighet at jeg verdsetter Bob Walkenhorsts forrige duoplate No Abandon veldig høyt. Platen som han laget sammen med Jeff Porter, er nok min favoritt fra Walkenhorsts karriere, etter Good News and The Bad News. Og etter å ha levd med For Tomorrow på øret i store deler av sommerferien, så kan jeg love at det norske publikumet kan glede seg til platen slippes (den selges på de norske konsertene, en måned før release). Tittelsporet «For Tomorrow» går ganske langt i å kommentere dagens USA, der politikken og frontene står steilt mot hverandre som vi aldri har sett maken til i dagens moderne samfunn. Bilder fra politiske hendelser, protester og marsjer ledsager teksten, og gir et kraftfullt inntrykk opp mot den kritiske men likevel håpefulle teksten. Klikk «Play» knappen i toppen av artikkelen for å se «For Tomorrow». Vi har tatt en liten prat med Bob og Una i forkant av plateslipp og Norgesbesøk. How did this project come to life? 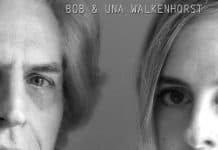 What is the background for «Bob & Una Walkenhorst» ? BOB: Una lived in New Orleans from 2015 to 2018. During that time, we only saw her a couple times a year. But we knew she was working hard on her songwriting and performing, and a lot of personal stuff. Towards the end of 2017, she was ready to leave New Orleans, but didn’t know where she wanted to move, and really didn’t want to move back to Kansas City. But we talked about the idea of making some new music together, and this might be the perfect, and only, time to do it. UNA: My dad and I had talked on and off for a few years about the possibility of making an album together, but the time was never quite right. When we realized we had this little window of time that lined up perfectly with changes in both of our lives, it was really exciting. We started off just trying to write a couple songs to see how it felt. When the songs started coming, we realized this could be something really special, both for people to listen to and to create together. 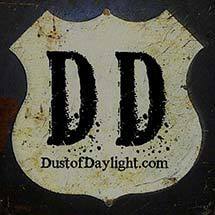 Tell us about the process, how did you two work on songs and the record itself? BOB: So we started sending each other song ideas in the fall of 2017, and she moved back to Kansas City in February 2018. By that time we had 5 songs finished, and were working on 5 more. We started recording right away, with the idea of keeping it very simple, very acoustic and human – no big production. So recording was easy and fast, and we were happy and excited about the sound and the songs. We finished the recording late May, and got things moving for vinyl production, which takes several months. And we wanted to be sure to have vinyl for our trip to Norway! Working on these new songs together has been a real positive learning experience for both of us. I learned to view and respect Una as a fellow artist first, and as my daughter second. Her ideas for songs, melodies and harmonies, and arrangements are quite different from mine, and she helped me hear and create music from a whole new perspective. Una, how is it like, working on music with your dad? And especially with someone as prolific a songwriter as Bob Walkenhorst? UNA: Especially when talking with other young musicians, I can’t help but feel extremely lucky to have this built-in mentor in my life. Not only have I had the chance to share a really memorable time with my father, I’ve also learned so many lessons along the way. On top of that, I have a whole new respect for my dad’s musical abilities. Before working with him, it was hard to see past him being my dad enough to be fully aware of his talent. 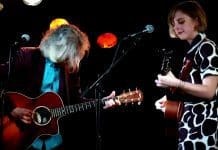 Now when we share songs or I see him perform, I can really appreciate what a gifted songwriter he is, what a unique voice he has, and how fantastic he is at bringing people together with his music. Between the writing process, the recording, live shows, and now traveling, I feel so fortunate to be able to share this experience with my family. There’s really nothing better than getting to do what you love with the people you love. BOB: And playing these new songs live, plus working up cool arrangements of some Rainmakers songs, has been such a joy. I get happy and emotional, and a little tearful, every time we play. Thank you, both. 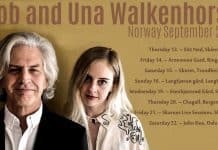 We look forward to seeing you in Norway in September!